Posted by Mark in VMware Server. Finally got an install of Intel’s RAID Web Console 2 I’m happy with. My server configuration is an Intel S5000PSL mother board with six SATA drives. Five are in a single RAID 5 logical array, with the sixth configured as a hot spare. All of this was configured through the BIOS RAID utility. Operating System on the server is the CentOS 4 x86 64 distribution of Linux with megasr driver (version 06.28.11.0.2006). I wanted to avoid installing a graphic user interface on the server. The server will be a VMware host for testing virtual machines, so I would like to keep the packages installed at this level to a minimum. This meant I needed a way to monitor and configure the RAID system without halting the OS and jumping down to the BIOS. My plan was to use Intel’s RAID Web Console 2 application client on a Windows PC talking to the server software running on CentOS. Both the Intel Deployment Assistant CD version 1.0.1 (June 2006) that was delivered with the motherboard, and the version 1.2 (November 2006) that I downloaded from the Intel site contained RAID Web Console 1.13. Installing and running this version in client/server mode only gave a Java popup window after 15 seconds or so with the message “No Servers Found”. 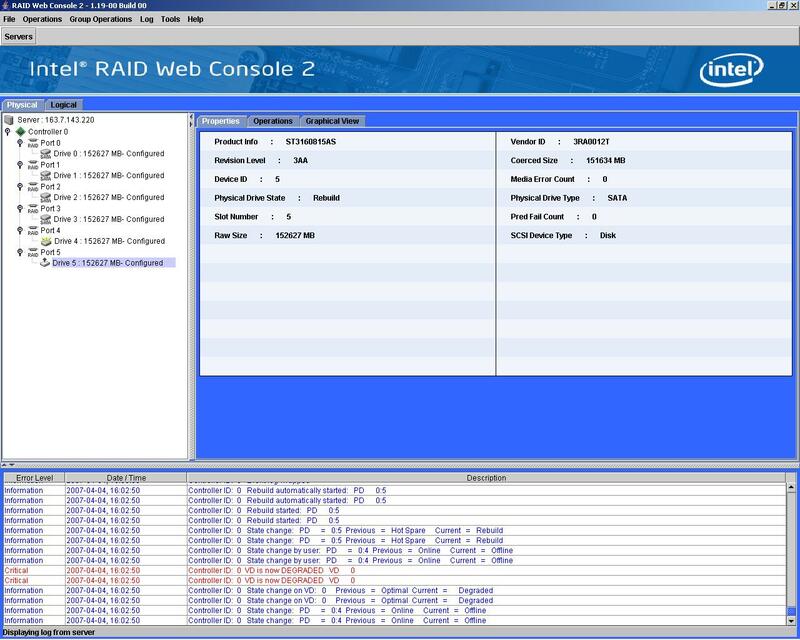 I found a more recent version of RAID Web Console 2 for linux on the Intel site (1.19), but struggled to find a similar version for Windows through the Intel site search. Finally, a google search (“RWC2 1.19 site:intel.com”) turned up a ReadMe file for the Windows version that let me guess the URL for the Windows download. The linux server side installed two services in /etc/init.d—mrmonitor and vivaldiframeworkd. I’m not convinced that vivaldiframeworkd started up on its own. It may also be that it died shortly after the installation, but I had to do a sudo /sbin/service vivaldiframeworkd restart before getting a successful test. I should do a reboot on the server to make sure that both of these scripts start up correctly. I also disabled the firewall on the server (using system-config-security) and did lots of netstat -ltpn and scrolling through /tmp/vivaldi_startup.txt before I saw that the service was running on port 49258. With all of the installs and uninstalls of different versions of RWC2 on both client and server, I’m not certain what may have interfered with the server coming up cleanly. Once both client and server were at version 1.19, the program came up successfully under Windows (though the java app doesn’t seem to show up on the taskbar until you have alt-tabbed it into focus). I did a quick backup of the server, then set disk 4 of my array off-line. Success! Though the virtual disk showed up as “degraded” in the RWC2 application, my ssh session from Windows to server was unaffected. My hot spare disk came into play and the array started rebuilding. The lights on the server flashed frantically for the next hour and fifteen minutes, before the Virtual Disk state returned to “optimal”. I marked disk 4 as a hot spare, then held my breath and physically removed disk 5 from the the disk bay. A rebuild started on disk 4 (again indicated by the RWC2 application and flashing lights). I marched the still-beating disk 5 around the house, showing it to a suitably unimpressed family (though Luke made an effort so I wouldn’t feel bad). RWC2 also removed the disk icon from the port 5 icon. I returned disk 5 to its bay, it showed as “unconfigured & good”, I right-clicked on it and again set it to “hot spare”. Still to do: See if I can integrate the RAID monitoring service into LogWatch, Big Brother, or some other alert system. The kernel driver you used, is part of the centos distro? Our did you get it from the intel website our maby the lsi site? I’m planning of installing centos 5 and hope to be able to control it with the web console. The driver version I’m using is megasr-06.28.1110.2006-1-rhel40-u4-all.img. I downloaded it from the Intel site–I think starting from here. I’ve since had some mysterious problems running VMware server on the system that looks related to a combination of CentOS 4 and RAID. It might show up with other applications that have heavy CPU use. An upgrade to CentOS 5 with RAID is supposed to fix the problem, so I’ll probably be upgrading at year’s end when my other projects slow down. Keep in touch and let me know if you have any problems with your installation–I will probably also run into them in a few weeks. I got it working! I have a Intel SRCS16 card and on the website of intel they provide an ir2_Linux_Webconsole_v2.8-00-5.tgz and that one works with Centos 5 x86_64. I didn’t use the intel kernel drivers since it did not want to load them. Surfing to http://myserver:3570 show a webpage and gives me access to manage my raid controller. Thanks for your inspiration that it was possible without commercial linux. I also run Vmware (1.03) server on mirror disk set with LVM & XFS. I can make lvm snapshots and boot the copy in vmware, very cool! It’s running now for almost 1 month and have no problems. Resizing the XFS with running vmware machine did not give any trouble. I try to install RWC2 , the name is ir3_Linux_RWC2_v2_19_01, it install with error (talking about conflict with libstdc++ library. After restariting Centos 5, Monitor and frameworkd start normal, but in RWC2 no any server in the servers list. In Bios I make Mirror 1 on 2 disks. What worng I make in instalation? Why RWC2 not working? Same proble as Yury. Any idea? Apologies for not responding to Yury’s original question–I had a look at the time and nothing immediately sprung to mind, beyond what was in the original post. Make sure that the client and server are at the same version (1.19.0 in my case). There are links to the client and server I used in the original article above. I’m assuming you’ve also done general network troubleshooting to make sure that you are able to connect to your server’s port from the client–I usually shut down Windows firewall completely when testing a new service. I’m still putting off my upgrade to CentOS 5 until I get a break in my project schedule. I’ll post a new article once I’ve done the upgrade with the collection of CentOS, megasr driver, and RWC versions that I find successful. Sorry this isn’t of more immediate help. I’ve tried multiple versions of web console from intel’s website but none of them work with my centos5. Just get “no raid servers found” when I open the program. Hi All! That’s /etc/init.d/msm_profile ? thanks. The script in comment 1 above is the top of /etc/init.d/vivaldiframeworkd . I recently need to use this onboard fakeraid bios to install on RedHat 4u6 and 5u1. I notice that there is a strange situation that I don’t know why. My motherboard has 6321 esb and the driver is megasr for linux. My configuration is raid 1 mirroring two drives. If I use linux dd=http://myserver/driver.img noprobe=ata1 noprobe=ata2 at the installation prompt. It shows two drives which are sda and sdb in 4.6 and shows /dev/mapper/ddifxxxxx in 5.1. If I use linux dd noprobe=ata1 noprobe=ata2 and choose driver disk from my usb pen drive later, it only shows sda (LSi MegaSR) which should be correct in both 4.6 and 5.1. Does anyone know why it has this difference? Either way it all prompts “loading megasr” when it is auto-detecting and loading driver. I use the 4u6 driver for 4.6 and 5u1 driver for 5.1, but I don’t know why the way from http differs from usb pen drive. Any help will be greatly appreciate. Should I be concerned that RAID Web Console 2 – v2.91 – 04 is reporting a Windows 2008 server as Windows Vista? I’d like to contact You about RWC 2 on CentOS. Is that possible? Please write to me. Hi,there. Intel just released the new version RWC2, I’ve set it up successfully on Centos5.4. With the RWC 2.8 i get “No Raid Servers available”. Make sure to use the latest version of RWC intel released. I’m using RWC 6.71-02 which relased in 4/20/01. Will this work with CLI only on CentOS? I’m using 5.5 for a PBX, and have the latest RWC2 installed with no errors, but my workstation still cannot find any servers. This is nearly the only discussion on the net, any help would be loved thanks! I’m using CLI only on CentOs 4. I have some X libraries installed, but I boot into text only. I found RWC2 very sensitive to version compatibility between client and server. I would double check that first. I’m always surprised at how much traffic it gets–I just documented everything I did (with lots of keywords) three years ago. I only have a few days’ experience and a fuzzy understanding setting up RAID on this system, but luckily it has focused the attention of several people with similar systems. Thanks to those of you who follow this page in email and are willing to add your experience to questions that are asked here! …doing a little more homework helped me realize these are the LSI Integrated Raid driver and the SNMP agent for it. im a little inexperience with doing so, but I will try updating these to see if it makes a difference. Just wanted to thank you for this post- saved me a LOT of time getting Webconsole working under 4 U1. The console seems to crash after 15+ minutes of usage, but otherwise works well. One thing i dont understand. Can RWC send allerts if UI is not start now? I’ve a undertaking that I’m just now operating on, and I’ve been at the glance out for such information. Bitcoin has experienced incredible growth over the last year and there will be some who will claim that the bubble is about to burst and Bitcoin plummet. Some of us still believe in the idea of a user owned outside of the control of the banks. We will not believe that Bitcoin is past it’s best. We will be staying with Bitcoin and I am quite certain that it will continue to rise more steeply than previously.